It's believed sea turtles have been around for more than 100-million years. They are practically dinosaurs. Besides laying eggs and the baby turtles' trek to the water, these reptiles spend almost their entire lives in the sea. In fact, males sea turtles will never return to shore after they hatch. Sea turtles can also go as long as five hours without needing a breath of air. 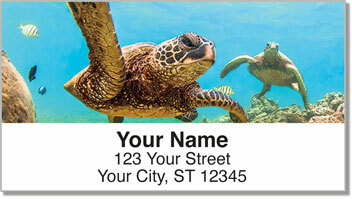 These return address labels feature four artistic illustrations of these amazing aniamls. They're an excellent finishing touch for lovers of wildlife. 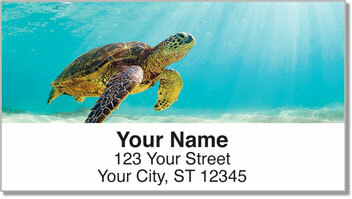 You'll appreciate how easy it is to prepare outgoing mail thanks to the self-adhesive backing on these labels. 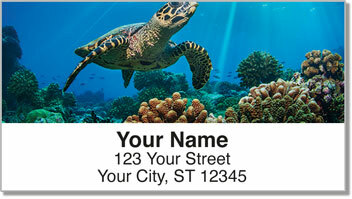 Instead of writing out your name and address by hand you just stick one of these in place! 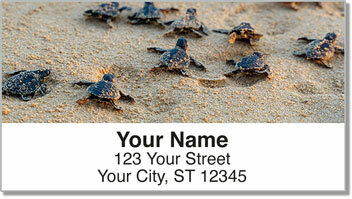 Order your own Sea Turtle Address Labels right now! Make your purchase complete and get some matching checks too!